My Dad and I donned our waders and spent a beautiful morning on the Susquehanna this past week. We fought some crowds, but in the end we had a great time and we each caught a bunch of fish. It seems like the fish are in various stages of the spawn--we've seen some post spawners, some actively spawning on beds, and some that are still quite plump with eggs. Overall, the average size of fish has diminished from what we were catching a few weeks ago, but there are still some big girls mixed in. All our fish were on jigs and soft plastics... though later in the week my Dad returned to the same area by himself and caught quite a few fish on the fly. In addition to the brozebacks... I also spent a couple hours chasing some largemouths and panfish this past week. 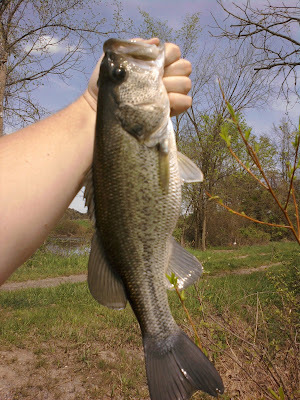 I decided to spend the afternoon fishing with my ultralight trout rod, as I was mainly after panfish... 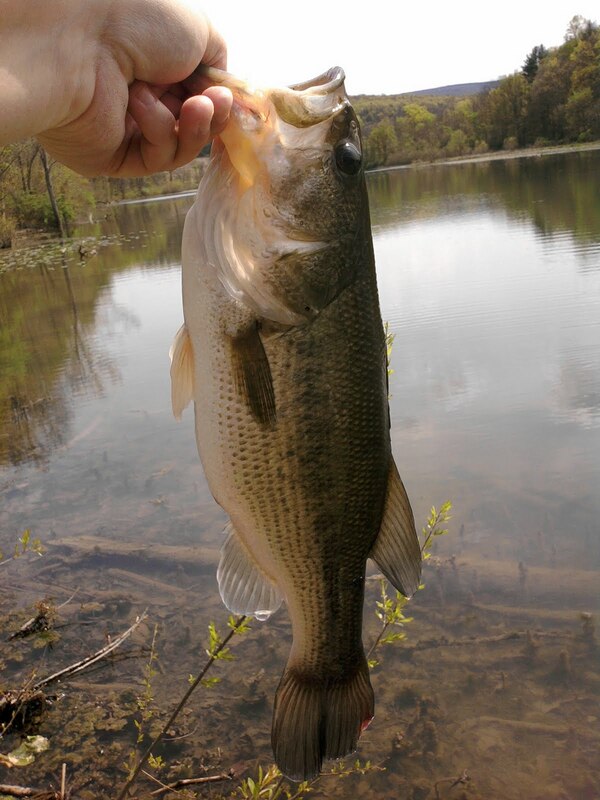 I'm glad I did b/c I had a blast, and I was totally outgunned by a couple of the bass that I caught. The first fish I caught was the largest... I had made it a point to be very sneaky upon my arrival to my spot, and I crept up to area hoping to not scare anything away. I used my polarized sunglasses and spotted a s mall largemouth sunning himself near a sunken log. I quickly tossed him a small soft plastic lizard bait, and I watch him turn and swim towards it. Then I continued to watch as a MUCH bigger bass came out from underneath the log and inhaled my lizard before the small one could get it... I set the hook and it was GAME ON! 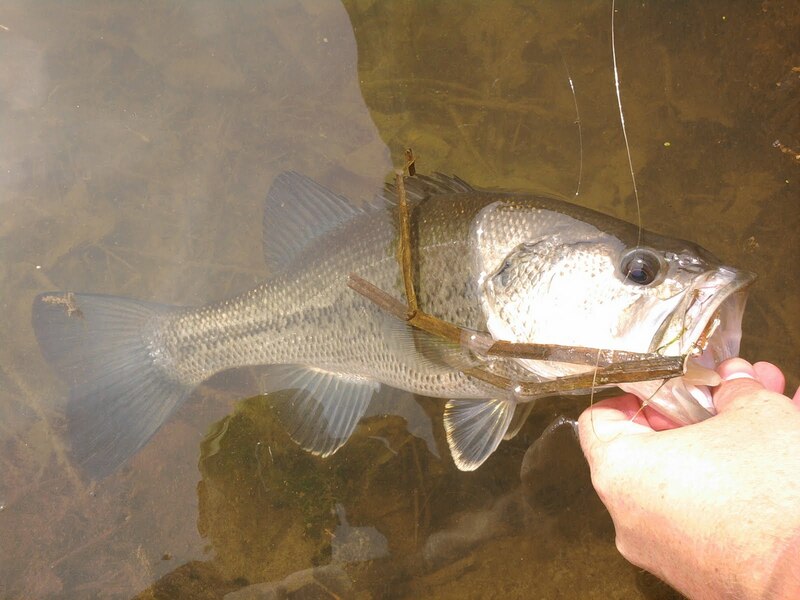 She pulled hard... and it was all I could do to keep her out of the log jam with my little 6 ft., 2-6 pound test rod. Luckily, I somehow ended up winning the battle in the end. I wish I would have gotten better pictures of her, but I was by myself and admittedly a little bit excited. She measured 19 inches and was very fat. After releasing her, I continued to bass fish for a while and caught a few largemouths--mostly small ones, but I did get one more good bass that measured almost 16 inches. Then I switched over to panfish and caught a bunch of bluegills, and one small crappie that I wouldn't have been able to keep had I wanted to, ha ha. To conclude this entry, I would like to mention an interesting article that I found this past week. The topic of the article is regarding the American eel and its role in our local ecosystem--namely the Susquehanna watershed. It seems that biologist are finding a link between the eel and a small freshwater mussel called the Eastern elliptio. Apparently this mussel gets its food by filtering the river water as it heads downstream to the bay...a very GOOD thing. Apparently, there has become fewer and fewer of these elliptio's in recent years and as a result they have not been able to clean the water as well as in the past. It has also since been discovered that American eels transported these small mussels throughout the watershed, but of coarse eels have limited travel through the Susquehanna system due to the many power dams on the lower river. So, if you made it this far through that blather of mine, and you are truly interested in the article... Here is a link: Eel Article. Check it out, if you are interested in the science and how it plays a role in the health of our local watershed you should enjoy it. Until next time, thanks for reading and I hope to see you on the water. Nice mixed bag of bass. I like those kind of fishing trips. Thanks, Juan! I like those trip, too.... Since we live here in such great smallmouth country, I think it's easy to forget sometimes that we can find some darn good largemouth fishing nearby as well. That said, it's been a while since I hit the river... 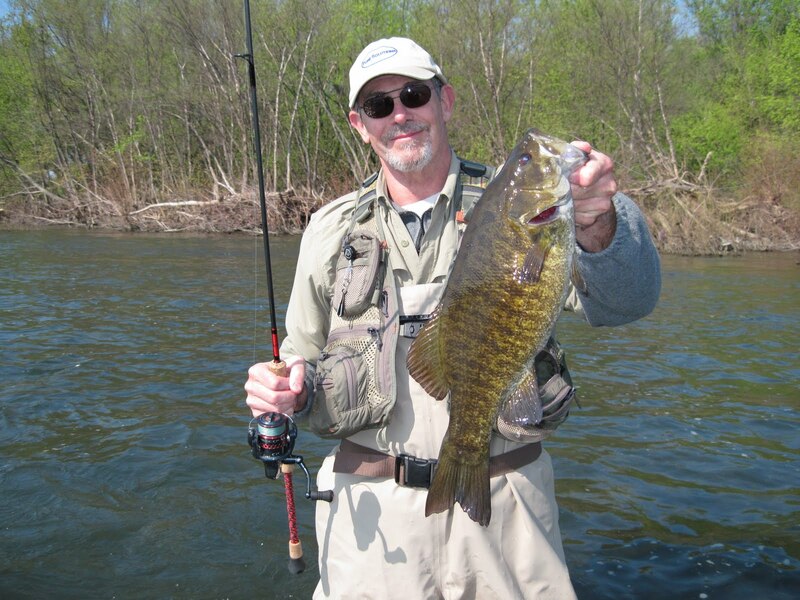 I'm starting to miss those smallies! From the sound of your reports on your site, you've been hitting them pretty good this Spring.